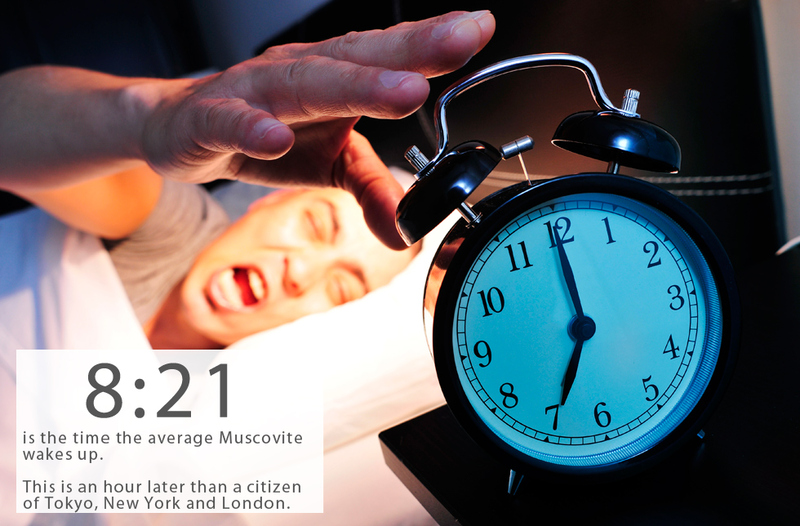 8:21 is the time the average Muscovite wakes up, according to data published by internet magazine The Village. This is more than an hour later than a citizen of Tokyo, who wakes up at 7:17. Second on the list of sleepyhead cities is Paris, with an average waking time of 7:56, while Hong Kong is third with 7:50According to the research, an ordinary Londoner opens their eyes at 7:31 and a New Yorker two minutes later at 7:33The Village reports that Muscovites also go to sleep later than citizens of any other city in the world. There are plenty of 24-hour businesses in Russia’s capital, from bars to food stores and even museums.Photo by Shutterstock. 8:21 is the time the average Muscovite wakes up, according to data published by internet magazine The Village. The Village reports that Muscovites also go to sleep later than citizens of any other city in the world. There are plenty of 24-hour businesses in Russia’s capital, from bars to food stores and even museums.